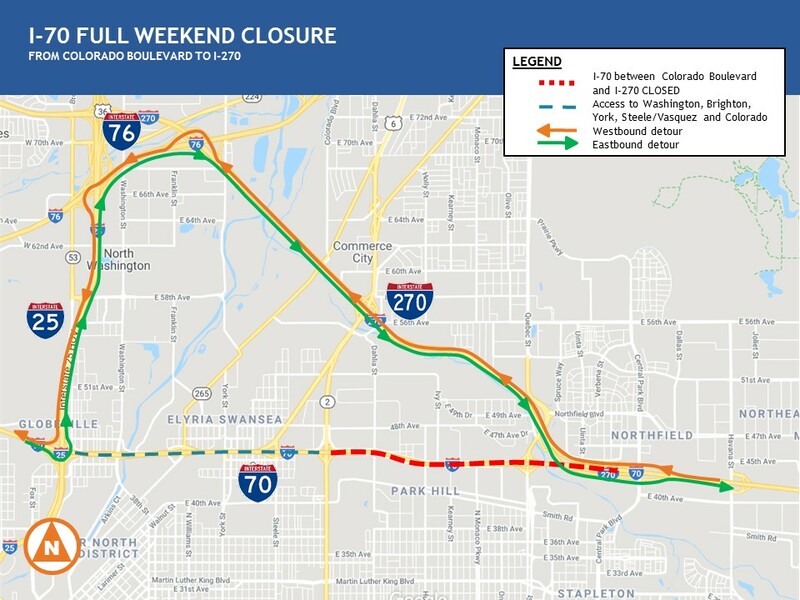 DENVER—From 10 p.m. Friday, April 12 through 5 a.m. Monday, April 15, I-70 will be closed in both directions between I-270 and Colorado Boulevard so crews can safely set bridge beams on the new I-270 flyover structure that will eventually take southbound I-270 traffic to eastbound I-70. Construction activities are weather dependent and subject to change. Don't cross solid lines when changing lanes. Turn on headlights so that workers and other drivers can see you. The Central 70 Project will reconstruct a 10-mile stretch of I-70, add one new Express Lane in each direction, remove the aging 55-year-old viaduct and lower the interstate between Brighton and Colorado boulevards. Visit the website to sign up for email alerts. Check out our travel impacts page. Watch progress on the webcam.